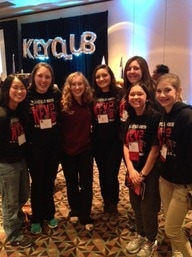 Plainfield North High School is proud to hold their Key Club charter since 2012 with Advisor Sarah Sicinski and Krystina Leyva leading students to success! With over 200 members, PNHS Key Club continues to grow each year and is always looking for new members to join! If you love volunteering and meeting new people while enjoying tasty snacks, then Key Club is for you! New members are always welcome. The Key Club officers are looking forward to bringing you an exciting year of service! Plainfield Library Student Advisory Board Dec. 4-4:45 The new Teen Advisory Board will meet at the library, 15025 S. Illinois Street in downtown Plainfield. This is your chance to have a say in what types of programs and materials the library should offer for teens. You can earn service hours, scholarships, and eat pizza! Please contact Teen Library Tracey Vittorio for more information at tvittorio@plainfieldpubliclibrary.org. IGrowChicago Coat Drive: Through Oct. and Nov. Donate new and gently used coats, of any age and size. Drop off in Room 317 and 424. St. John Lutheran Church Food Pantry: Saturdays 9-11am Go to https://www.stjohnfood.org/ for more information.